Following are issues that may occur when using the Flare navigation links. Access to path "C:\[pathway]" is denied. This issue may have one of the following causes. Flare is trying to reference a file whose pathway does not exist. Make sure that the topic you are trying to link to is checked out from source control. Flare is trying to reference a file whose attribute has been set to "Read-only." Make sure that the following Flare project folders are not set with a "Read-only" attribute: Analyzer, Users, Output, and FileSync. 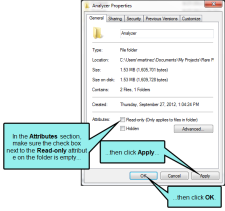 Navigate to the Flare project folder's location and open the folder. 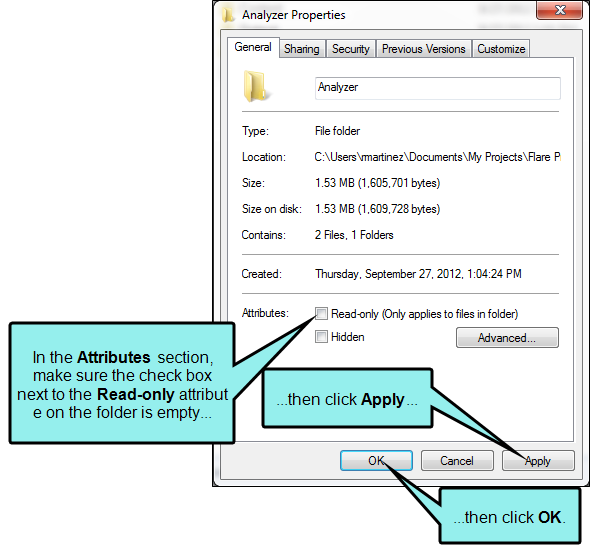 Right-click the Analyzer folder and from context menu, select Properties. In the Properties dialog, locate the Attributes field and click the Read-only check box so that it is completely empty. Repeat steps 1 through 5 for the Users (the Users folder is located inside the Project folder), Output, and FileSync folders. Insert the hyperlink again. It should now work.